Our second round of traveling quilts has begun! We (Renee, Laura, Ashley, Michelle, Liz, and myself) traded our quilt starters at QuiltCon (end of February). Instead of passing the quilts along every month, we're going to give two months for each switch. I'll always received from Ashley and pass on to Laura. This bee really pumps me up because the quilts are extra special and these sewists put forth their best work. Last month, I blogged about the color scheme and the curves theme. Anything curves goes; I've been adding to a Pinterest board every time I encounter inspiration. For my quilt starter, I made a huge drunken star and improv pieced some scraps with curves (I realize there are a couple of wrinkles, but I'm not worried because I'll quilt it to death. I may even just adjust the end of the seam when I get the quilt back!). I was inspired by Rachel's Oodalolly quilt. 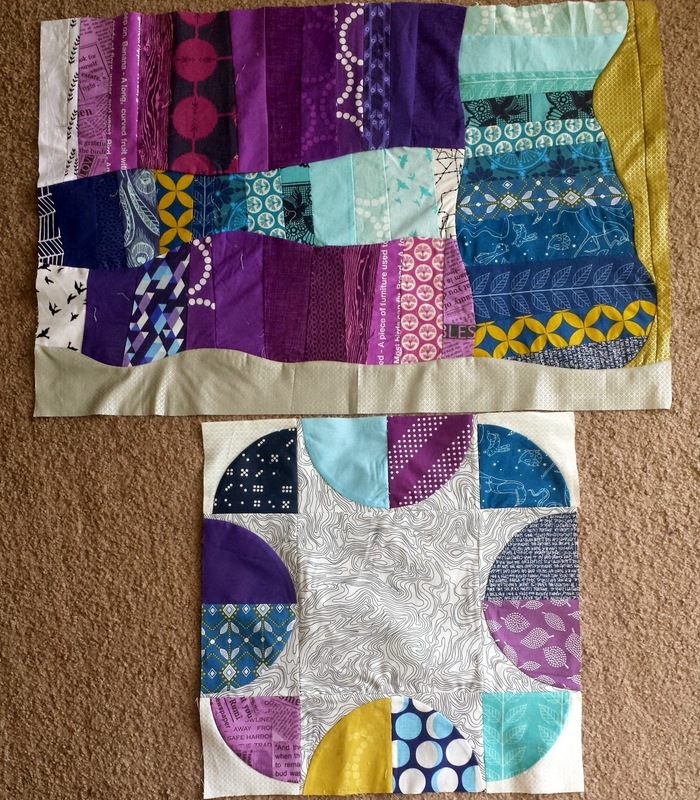 I can't wait to get my kitchen sink quilt of curves back! In the meantime, I'll be working on Ashley's row by row rainbow (ah! I call purple churn dashes!) and drooling over Renee's recently finished first round quilt (her blog post will surely be up soon!). I should probably also think about how I'm going to quilt my first Sisterhood quilt. Down with WIPs! Your drunkard star looks great! When you say huge, how big did the block finish out? Curved piecing always seems a bit wonky to start (or maybe that is just my curved piecing), but quilting and a first wash have fixed all mine so far. :) It is going to be fun to see these grow. So pretty to see them next to each other! It's going to be such a fun quilt to work on. I'm off to put mine in the washer!